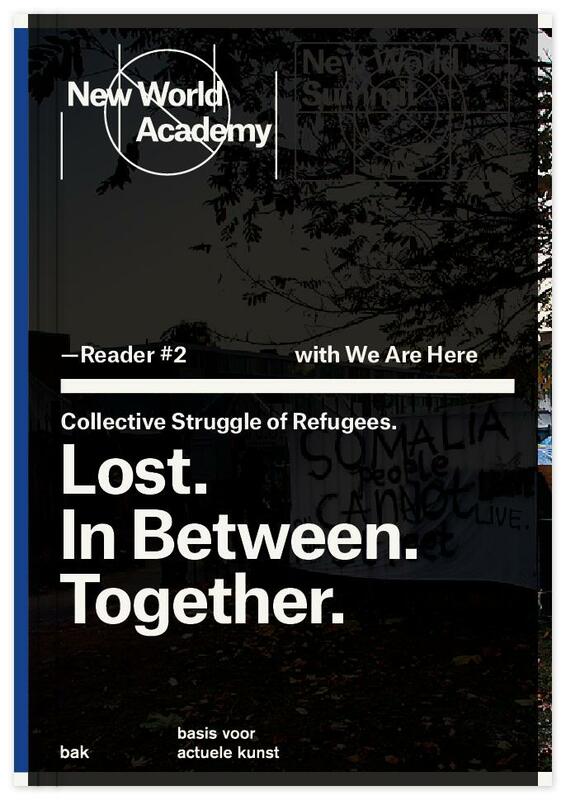 We Are Here consists of a group of about 200 refugees who first organized themselves into a political group in 2012. The group is based in Amsterdam and demands citizenship for all of its members, some of whom have resided in the Netherlands without official papers for over 15 years. Their key uniting principle is that the group accepts no individual solutions for its members—only full recognition of the legitimacy of the group and its members as a whole. Because Dutch law forbids refugees from performing labor—with “creative expression” exempt from this official definition of labor—art has played a significant role in shaping and exploring the political demands of the group since its founding. With contributions by: Patrick Bernier and Olive Martin (artists, Nantes) with Audrey Chan (artist and writer, Los Angeles), Immigration Movement International (artivist platform, various locations), Savannah Koolen (activist, We Are Here Action Center, Amsterdam) and Elke Uitentuis (artist, We Are Here Action Center, Amsterdam), Cyriaque Kouenou (lead singer, We Are Here Band, Amsterdam), Yoonis Osman Nuur (representative, We Are Here, Amsterdam), Ahmet Ögüt (artist, Istanbul, Amsterdam, and London), Martijn Stronks (theorist, Amsterdam), and Thomas (representative, We Are Here, Amsterdam).